As owners of Kihei Kai Premium Condo #20, we welcome you to our attractively decorated and well-maintained condo with up-to-date features that include a modern kitchen with chef’s dream appliances and energy efficient, quiet, state-of-the-art air conditioning units in the living and bedroom areas. Add to this the comfortable memory foam queen-size mattress in the master and a sofa sleeper in the living area. Other features include a flat screen smart TV in the living area with second flat screen in the bedroom in addition to free, high-speed Wi-Fi as well as a safe for your valuables. 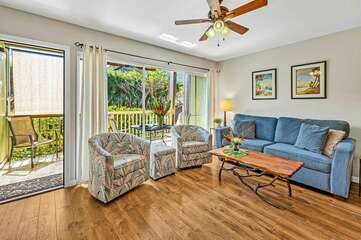 These conveniences can add to the comfort of your Maui experience along with the partial ocean view at garden pricing with a beautiful view of garden palms. Aloha.